Zoom imageCruise ship passengers being entertained at Fetlar hall The last planned cruise ship visit of 2017 took place on Monday 21st August. The ship mv Hebridean Sky was on her third vist this year following on from two visits last year. 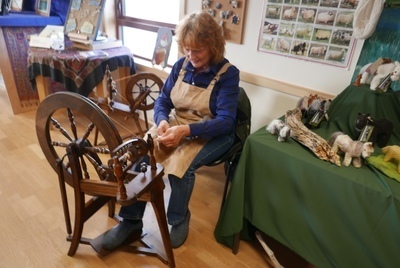 The community put on a fantastic display of crafts and craft demonstrations including spinning lace yarn. The passengers were well catered for by the local ladies with a great selection of homebakes and the Yell based Trio of Johnie Clark, Eric Williamson and Robert Goodlad provide excellent music during the afternoon - thanks boys. 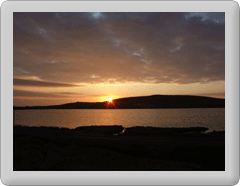 The weather also held and the sun made an appearance allowing Fetlar to be seen at her glorious best. Top sellers on the day were the young pupils of Fetlar Primary whos confident direct sales techniques for their trea towels brought ringing praise from many of the visitors who were very taken with their abilities and confidence. We look forward to welcoming them back in 2018. 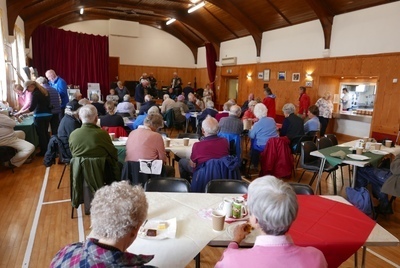 Pictured top is the hall showing passengers enjoying tea and hombakes while listening to music or browsing craft stalls. Below is Joanne Bell demonstrating spinning. Joanne makes the beautiful Russi foals seen in the picture, personally undertaking every stage of the process from shearing their Shetland sheep to making the finished article.